According to a post by Robert Galbraith for Reuters, the Newark City Council has just voted to create such a community on 200 acres of marshland and space owned by chemical companies, though the form it will take will ultimately result from a variety of inputs. In 2006, California passed AB32, The Global Warming Solutions Act, with a goal of reducing the states total greenhouse emissions to 1990 levels by 2020 – a goal requiring massive change in a good many fields, including the production of food and power, not to mention the cars driven. In the last four decades, the state’s population has doubled from 19 million in 1970 to 38 million in 2010. People gravitated there for many reasons – the constant climate, the vibrant economy and many more for the ocean and its balmy beaches. So the state that invented the freeway system has further reason to change – in the degree of gridlock affecting not only the massive urban areas, but the highways connecting the various parts of the state as well. So what so what would you do in a state where you don’t need a weatherman as much as smoke jumpers and mudslide controls? The effects of global warming are shrinking the beaches along California’s 840 miles of coastline via virulent storms, depleted sand supplies and rising water levels. The effects of global warming are expected to produce a 100-year redefinition of the California coasts, as sand is washed away from smaller beaches and redeposited on the larger ones. Unfortunately, when a beach shelf has no sand, the power of the wind and water is unleashed upon the bedrock itself, slowly eroding little bits of America into the sea. California has no shortage of environmental groups focused on protecting the state and various aspects of it, illustrated by the legislature taking the lead on greenhouse emissions. So the Newark City Planners have envisioned a place where you can walk to shopping or school, and ride the train to all the jobs in the nearby Silicon Valley, but it’s a long way from the vision to the reality. When the relatives come to visit where will they park, even if it is an electric car? Will they park in the city and ride the train to visit the grandkids? 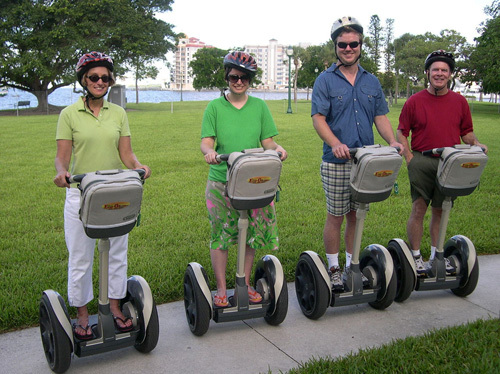 In a pedestrian-based community, how long will it be before people on Segways make walking impossible? What will we do with reckless nine-year-olds joyriding in dad’s one-person two-wheeler? In any case, it’s a good thing someone’s looking for an answer. "Going forward, state and federal transportation dollars can only be dedicated to projects that are consistent with the sustainable communities plan," California Senate President pro Tem Darrell Steinberg told Reuters. "I call it a hard carrot. It's a carrot, but if it hits you, it might sting." California is a leader in the movement towards sustainable development. They have little choice as population projections for 2050 may surpass 50 million. By then, the law sets a goal of reducing greenhouse emissions by another 80 percent. Achieving these lofty goals will require the state to generate 90 percent of its electrical power from wind, solar or other CO2-neutral sources as well as making a total conversion to electric powered or other emission free vehicles. John Grantham is an economist who predicted the collapse of the mortgage market a year before it occurred. In an article titled 10 explosive bubbles that will kill capitalism, he points out one of the failures of the best system in the world is its basis on the Myth of Perpetual Growth. Sustainability is the only way we can preserve our system – this grand experiment in creating a democratic republic. That is also a lofty goal, but if California can find its way, there’s no good reason 49 other states can’t as well.